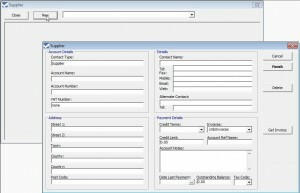 The Supplier data is accessed by several of the stock control software program modules such as sales orders, purchase orders, stock records etc so enter it to the business management system correctly. Click Supplier on the Main Menu of the stock management program. In the screen that opens click New to access the New Supplier form. Enter the supplier’s name in the Account Name box. Use the full name of individuals and the trading name of companies and organisations. Spaces can be used in the Account Name but avoid using non-alphanumeric characters. Click in the Account Number box. The inventory control software system will automatically generate a unique Account Number. This is actually an alpha number, similar to the short name generated by SAGE. This number is unique to each individual Supplier, even ones that share the same name. Enter the other details, address, contact names, phone numbers and email addresses etc into the stock control software program. In Payment Details use the drop down arrows to select the appropriate Payment Terms and Tax Code that were set up in the Financial section of the stock control and invoice management software. The Tax Code will normally be T1 for VAT Registered suppliers. Use T0 for unregistered sole traders or imported supplies. When you have completed the form click Finish to save the entered data into the warehouse management software system. While the new supplier form is being set up you can alter the automatically created Account Number. Once the Finish button has been clicked you can no longer change the Account Number or Account Name. If you alter the automatically generated Account Number the sales management system will check against existing suppliers to make sure no duplication occurs when you click Finish. 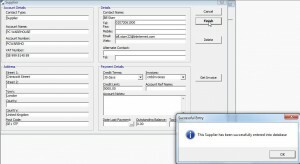 The invoice management software system will automatically flag the any duplicates and generate a new unique Account Number when you click Finish. If you are happy with the new automatically generated number click Finish again to get the new supplier account saved to the system.